This was hardly the only instance of an attempt to pass off a terrorist atrocity as something else. The Israeli penchant for identifying spit in the face as droplets of rain is ongoing. Hence there’s still a lot of speculation among us about whether 9-year-old Noam Glick was injured recently by a common thief or a terrorist and about whether Sraya Ofer was gruesomely hacked to death a few days later by criminals or terrorists (never mind that the distinction between the two is often artificial). Was Tomer Hazan of Bat Yam abducted and slain by a private entrepreneur or by a terrorist? And who at all was it that fatally shot Corporal Gal Kobi near Hebron’s Cave of the Patriarchs? Was it an expert terrorist sniper or a freelance amateur sharpshooter? Was the tractor driver who broke into an IDF camp near Ramallah a garden-variety madman or a sane terrorist? In truth, it almost doesn’t matter whether the accumulation of apparent acts of Arab terror in recent weeks signals the start of a new so-called intifada, whether the violence was synchronized by an unseen hand or whether it’s nothing but a meaningless random accrual of unrelated forgivable felonies. What matters is that the combination of the Palestinian Authority’s seeming negotiating stance with an implicit terrorist threat isn’t something which – by the light of our past experience and objective observation – can be reasonably ruled out. The latent underlying intimidation is interminably there. Recent history has taught us – with alarming consistency – that the launching of any round of talks with the PA inevitably brings with it bloodshed. Prattle about peace in our region is consistently accentuated by slaughter. The quest for coexistence is accompanied by casualties. This should have been apparent already in those first heady post-Oslo days when the nitty-gritty of the accords were being hashed out. The talks were conducted as buses exploded in our cities, as a trip to the supermarket became a mortal risk, as did a meal at a restaurant or a quick bite at a fast-food eatery. By way of prescribing opiates to dull the pain, the leaders who brought us Oslo sought to sooth our anxieties with assurances that the dismembered corpses and maimed civilians were “victims of peace.” Their reprehensible notion was that peace is a proverbial Moloch which needs to be repeatedly satiated with human sacrifice and that it is somehow commendable to offer up innocent lives for a popular cause. If that weren’t enough, we were treated to a sadistic rerun of the initial Oslo bloodletting when then-premier Ehud Barak attempted a quick fix for Oslo with the avid assistance of US President Bill Clinton at Camp David in 2000. Barak had planned on giving almost everything away to his then peace-partner Yasser Arafat, but with one major hitch. He wanted Arafat to declare that the conflict thereby concludes. No more demands, irredentist aspirations, or pretexts for forthcoming ferment. The whole Clinton-enabled deal fell through because Arafat couldn’t abide “end of dispute” phraseology. He couldn’t countenance committing himself to any blueprint that would legally leave Jews a sliver of a toehold in their ancestral homeland (to which, he told an astounded Clinton, the Jews had no connection whatsoever and that “there never was a Jewish Temple in Jerusalem”). Since Barak’s earlier unilateral retreat from Lebanon convinced Arafat that Jews could be forced out, he launched his bloody intifada just to avoid the unthinkable pledge of “no more bloodshed.” And so, yet another peace-formulating session was underwritten in blood. Predictably, the announcement of any parley unavoidably brings with it heightened danger. This is a fact of life which no obfuscating words can conceal, not even if they come from the current White House resident, who – admittedly amid honeyed blandishments – insinuates that Israel’s existential interests somehow negate harmony in the Arab/Islamic realm. The upshot is that PA head honcho Mahmoud Abbas needn’t necessarily issue explicit orders for an orchestrated intifada as his predecessor Arafat did thirteen years ago. It’s quite enough for Abbas to somewhat reduce his police force’s anyhow inadequate anti-terrorist vigilance, while ramping up already virulent anti-Israel incitement in his official media, his school system and the mosques he controls. In itself, this serves to issue an implied warning to Israel that outright hostilities remain a viable option should Israel not cave in to Abbas’s demands at the negotiating table, where his own representatives have so far shown zero predisposition to any hint of compromise. Abbas may be weak and his very survival may depend on Israeli goodwill, but weakness can be bizarrely played as a strong hand. Abbas can unofficially sanction terror and his message therefore is that if the Israeli side relishes calm, it would be wise to pay up. Abbas may not have commissioned the recent assaults on Israelis but he needed only free up the reins a bit in order to essentially prepare the ground for a more escalated terror campaign, should he consider it desirable at any point. He figures that Israeli PM Binyamin Netanyahu is well aware of this tactic but cannot do much about it. Netanyahu cannot so much as make tough sounds. He cannot risk being blamed for a likely failure of the negotiations and is therefore likely to keep mum. He will furthermore have no choice but to keep freeing convicted terrorist murderers as “a goodwill gesture” to buy Abbas’s very participation in the talks. This incremental process will continue no matter how much Abbas violates the trust nominally put in him (and exorbitantly paid for) and no matter how much the convicts’ phased releases inject fervor and reinvigorated motivation into terror cells in Abbas’s bailiwick. Despite itself and against its own vital interests, Israel is forced to continue performing in a theater of the absurd. This too is further fallout from the Oslo fiasco. The most outstanding absurdity is that Israel – a democracy which craves peace and keeps forking out for it excessively – is the one required by the international community to keep proving its dedication to peace. This isn’t a mere ethical farce but it exacts real cost in our long term ability to withstand pressure and safeguard the most elementary defense prerequisites for Israel’s citizenry. The need to prove our good intentions, while facing duplicitous and treacherous enemies, is corroding and debilitating. For the most valid of security reasons, for example, Israel must retain control of the Jordan Valley or expose its narrow waist to lethal attacks from the east. Yet in unfriendly political salons abroad our inability to confine ourselves again into “the Auschwitz borders” (a term coined by Israel’s ultra-dovish late foreign minister, Abba Eban), will single us out as the obstructionist side. No one knows our geography nor cares that at its very center Israel is just nine miles wide and that its population alone is threatened with annihilation. There’s no sympathy in foreign capitals for Israel’s demand that it be recognized as a Jewish state – according to the UN’s own 1947 Partition Resolution which the Arabs belligerently rejected. That Arab refusal to accept the legitimacy of Jewish statehood is the root cause of the conflict rather than the creation of another Arab Palestinian state. But Abbas seems to be getting away with the affectation that he had already recognized a characterless state called Israel. Further legitimizing it as a Jewish state would mean that Abbas would be waiving “the right” to Arabize said state. For now, it’s okay by Abbas if the third Arab state in the original territory of the British Mandate (after Jordan and Palestine) is temporarily known as Israel. This doesn’t preclude overrunning it with millions of “repatriated Arab refugees.” The name will be changed later by a future Arab majority. No point to quibble about it prematurely. 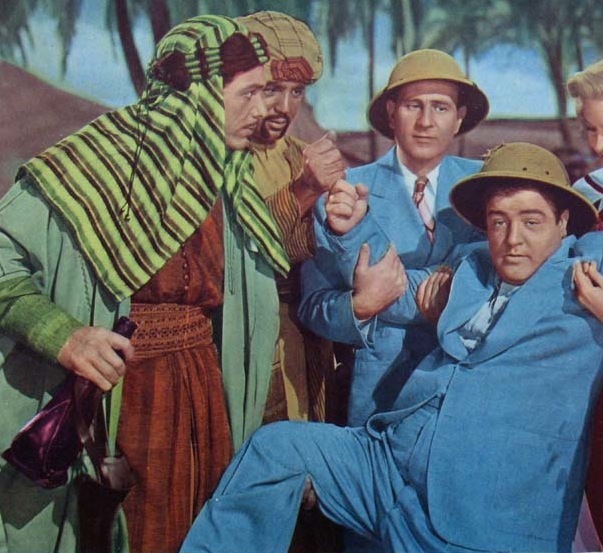 And so we are trapped in a vicious cycle born out of a process that was supposed to liberate us from what is insincerely dubbed “the cycle of violence.” Anyone who has ever watched the 1944 Abbot and Costello classic, Lost in a Harem, will recognize our predicament. In our own no-less loony reality, Abbot’s admonition would translate into fear of arousing the displeasure of world opinion, which is perpetually primed to censure Israel should it become vexingly uncooperative and tell it like it is – Costello-style. Where have you been? I hope you are well. So very glad when I received this new post! Damned if we do – damned if we don’t. Time to do what we need to do = non capitulation to the demands of the enemy that desires our annihilation to the last child, whether the present “pseudo” peace talks continue or not. Our gestures (now and in the past) of goodwill are only ever construed by the arab mentality as weakness to be exploited. Furthermore the world at large cares not one jot that we display by example the elements of equity, and yet get punished for doing so through continual terrorist acts and threats. As long as there is NO unified honest and genuine declaration that Israel and Jews at large have the inalienable right of existence – we cannot afford to let our guard down for a moment. We are only given credence and respect when we show strength of character and action. THANK YOU DEAREST UNCLE !!!!!!!!!!!!!!! Victims of Peace is as eerie as Arbeit Macht Frei. I used to shake my head and say a loud NO to myself when the thought that apparently high-minded advocates for the Peace Process forever pressuring Israel for more deadly concessions were not high-minded or well-meaning or naive or just plain stupid at all, but murderers at heart, consumed by hate, bent upon herding Jews into a grisly death-trap, would cross my mind. Well, maybe there are still some Jewish dupes around among them, alas, but most everybody out there who proclaim they’re pro-Israel and are looking out for her interests while they pressure her for Peace in the face of violent Middle East upheaval and unrelenting threats, murders, and calls for the death of Jews are up to no good. Always GREAT, to have you back ! I will look for that Abbot and Costello classic…that’s for sure. In fact Israel holds ALL the trump cards in that show and it MUST and it WILL win. Sarah, I repeat again; “if you keep doing what you are doing, you will keep getting what you are getting”..Israeli leadership can take a good lesson from its technologys, medical, military and farming SUCCESSES! All through Great leadership in these various fields. Respect in the middle east comes only from STAND UP convictions which can ‘Overwhelm’ the EVIL & DISRESPECT that has come from Israels ‘nay sayers’. Who will be the Next Stand Up Israeli leader? I wish this wasn’t so true…but it is! Sarah–very glad to see you are alive and safe. Best wishes from the USA. I thought it was Sadat and Begin. Golda Meir had resigned after the Yom Kippur war mistakes. By the way Sarah…if you think that Abbot and Costello are funny, you don’t know Uncle Noody and me…!!! I think Sarah already knows us, and I’m pretty sure she likes us more than Kerry and Obama, and maybe even more than Livni and Gal-On.